Mouth open, tail twitching, this chipmunk was sounding the alarm. But why? Have you ever been walking peacefully along on a warm afternoon, enjoying the sounds of nature, when suddenly a grating sound not unlike the popping of a flame starter on a gas stove, but about one hundred times louder, pierces your ears? That’s what happened toward the end of our walk this afternoon. Usually, we don’t get to see the culprit, but today it was perched right on a stoop for any passerby to see. CHIP! CHIP! CHIP! it called, warning its comrades of a danger we could not see. 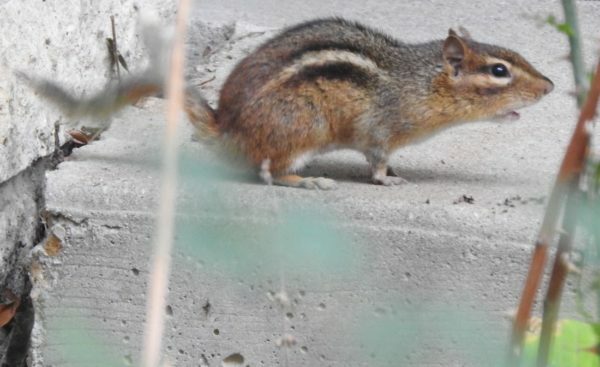 The chipmunk had a notch in its left ear, but I don’t think that’s what all the fuss was all about; the notch didn’t look like a recent injury. We’ve had a vagrant tomcat prowling around lately, annoying the begeezus out of all the resident cats, but it was nowhere in sight. Perhaps we were the danger. Twitter party tomorrow for my second Chicken Soup for the Soul book!